The Economic and Financial Crimes Commission (EFCC) was able to recover crime – related funds amounting to N473b in addition to $98,258,124.97; £294,851.82; €7,247,363.75; 443,400 Dirham and 70,500 Rand, the Commission’s acting Chairman, Ibrahim Magu has said. Magu also confirmed that identified whistle blowers, including the Osborne Towers, Ikoyi whistle blower were being paid timely to encourage other Nigerians buy into the policy. During the course of 2017, the Commission also succeeded in securing final forfeiture of the Osborne Towers, Ikoyi cash of $43m as well as N32b; $5m recovered from a former Petroleum Resources Minister and N449m discovered at Legico Plaza in Victoria Island, Lagos, he said. 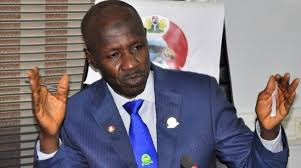 While defending the Commission’s 2017 budget before the Kayode Oladele-led House of Representatives Committee on Financial Crimes yesterday, Magu said the $43m Osborne Towers cash got forfeited to the Federal government because no one came forward to claim it. The Committee had asked Magu whether the Osborne cash was ever traced to anyone. In response, Magu explained that the document recovered from the property from where the money was recovered showed that it belonged to a company owned by the wife and son of a former Director General of the National Intelligence Agency (NIA). However, after due diligence and no one coming forward to calm it, the court had to pronounce it’s final forfeiture, he said. Among other recoveries and forfeitures from proceeds of crime, Magu said over N329b was recovered from petroleum marketers by the Kano office of the Commission; withholding tax recovery of over N27.7b from banks; €6.6m recovered from Nigerian Ports Authority (NPA); recoveries of about N1.1b on behalf of AMCON; and recovery of subsidy fraud funds of over N4b. Magu however reiterated government commitment to the whistle blowing policy, saying, promised incentives are being paid timely. Saying that the Ikoyigate whistle blower has also been paid, Magu noted the payment policy was meant to encouraged more Nigerians to join in the campaign against corruption. “Delayed and irregular release of the overhead component of the recurrent vote affected the commission’s investigation and prosecution activities especially in the Zones. “Out of the total sum of total sum of N17,202,253,360 appropriated in 2017, only N11,737,492,342.07 or 68 percent has so far been released out of which N9,759,277,008.53 has been utilized. “From the sum of N7,127,316,354 appropriated for Personnel, N6,533,373,324 was released; from N3,000,713,298 appropriated for Overhead only N1,667,007,163.70 has been released while from N7,074,223,708 appropriated for Capital expenditure, only N3,537,111,853.87 was released to the commission so far,” he added. He also complained that the Commission’s 2018 budget proposal of N45b was reduced to about N21b, which is capable of hampering the activities of the Commission for the year. Magu also informed the Committee that Nigerian Financial Intelligence Unit (NFIU) has been granted autonomy. “In the course of the outgoing financial year, the NFIU was granted self-accounting status by both the Office of the Accountant General of the Federation and the Budget Office. Effective date of implementation is 1st January, 2018 with a budget proposal of N2.903b,” he said. Of the sum, N339.350m was proposed for Personnel cost; N22.500m for meals and refreshment to cater for numerous sub-regional, national and internal meetings while N26.500m was proposed for publicity and advertisement for stakeholders in the financial sector.